Oryx and zebra silhouettes against green desert grass. Crystal clear air. A horizon that embraces infinity. Cheetah brothers enjoying their reign. Wild dog yearlings learning to become fleet of foot. Tsum Tsum plains open for business as raptors take to the skies and a young aardvark runs for cover. Honey badgers emerge in the night. There’s work to be done and the night is still young. This safari was designed simply as a sample itinerary for safari buffs. The properties on offer give us the opportunity for all kinds of permutations and combinations and the safari program can be tweaked to meet your exact interests and requirements. 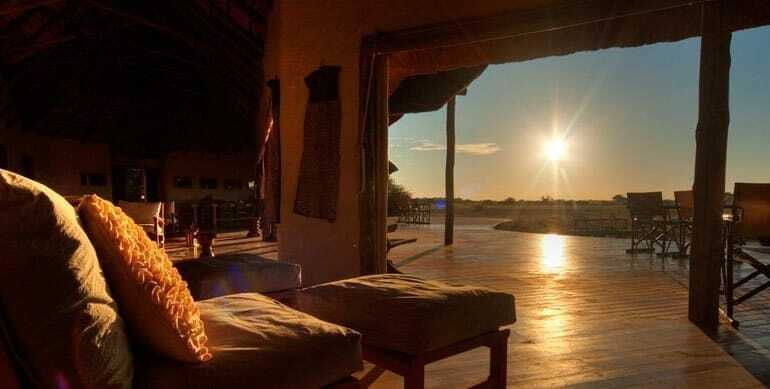 Botswana is home to some of the most expensive and exclusive safari camps in the world, but once a year, some of the best camps in prime locations open their doors to safari goers at surprisingly accessible prices – often a third of their high season prices. We believe this is excellent value for the quality of sightings and guiding you will receive at these destinations. So if you are a serious wildlife enthusiast who has always been tempted by Botswana but prices have discouraged you from enquiring, look no further, this one is for you. Your first stop will be Kwara Camp in the huge 430,00 acre concession in the remote northern reaches of the Okavango Delta. Kwando camps are well known in the safari world for their superb guiding and tracking skills. You will then be transferred to Lagoon Camp along Botswana’s border with Namibia. Although primarily a dry season camp, the Kwando Linyanti concession is rich in predators, so you can expect some good sightings here if lucky. Then it is onto to Nxai Pan Camp which hosts impressive herds of zebra and oryx during the rainy season, as well as predators. This safari tour begins and ends in Maun. Intra-camp transfers done on bush flights.